[News] "Cousin" Lee Sang-woo cast for "Feast of the Gods". Lee Sang-woo from "A Thousand Days' Promise" has been cast for the MBC drama "Feast of the Gods". Lee Sang-woo takes on the role of Do-yoon in the drama "Feast of the Gods" coming next January. He has a well-off mother that is the chairman of a successful food company, but he isn't on good terms with her, and works as a waiter and busboy in order to become a successful businessman, all for the woman he loves. Lee Sang-woo from "Life is Beautiful" and "A Thousand Days' Promise" will lead the drama this time. He is currently playing the role of Jae-min, Soo-ae's cousin in "A Thousand Days' Promise" -- a caring and considerate character who is under the spotlight as much as the main cast. With Korean food as the subject matter, "Feast of the Gods" revolves around two female chefs and their intertwined fates, following the previous dramas "Dae Jang Geum" and "Gourmet". Other than Lee Sang-woo, the cast includes Seo Hyeon-jin, Joo Sang-wook and more and Seong Yoo-ri could be the next leading character. The producer of MBC's "The Greatest Love", Lee Dong-yoon, and writer Jo Eun-jeong from "Golden Fish" and "White Lie" will be collaborating on this one. Coming in January. [News] Ji Jin-hee's transformation into a uniform-wearing pilot. Ji Jin-hee transformed into a pilot wearing a uniform. Ji Jin-hee takes on the role of pilot captain Kim Yoon-sung in the SBS drama special "Take Care of Us, Captain". The drama started shooting on the 31st of October and he has been in Australia showing off his pilot's uniform. He has shed his kind image from "Dong Yi" and is about to display some a thorough and strict charisma. He wears a poker face and doesn't lose his cool in any situation but on the inside he's actually very warm and humane. Ji Jin-hee has been focusing hard on turning himself into Kim Yoon-seong. The first episode comes on the 4th of January. [News] "Padam Padam" Comes Out with Official Posters. With barely a week to go before first broadcast, “Padam Padam” comes out with its official posters featuring leads Jung Woo Sung, Han Ji Min and Kim Bum. The posters build on the slight fantasy elements of the drama that was first glimpsed in the teaser trailer earlier released. “Padam Padam” centers on Yang Kang Chil (Jung Woo Sung), a man falsely accused of murder and imprisoned for 16 years. Upon his release, he meets and falls in love with a veterinarian Jina (Han Ji Min). Yang Kang Chil is under the protection of Lee Kook Soo (Kim Bum), his best friend and guardian angel. Though posters are recently released, the drama has been steadily gaining attention with the release of stills and behind-the-scenes photos since it was announced. “Padam Padam” launches the new cable channel jTBC when it premieres on December 5. [News] "Sungkyunkwan Scandal" Producers Doing a Musical Drama to Compete with "Dream High 2". The writer-director team behind the successful 2010 drama “Sungkyunkwan Scandal” are working together on a new project. Local news agencies report that director Kim Won Seok and writer Kim Tae Hee are currently developing a new musical drama set in high school for cable network Mnet. The title of the drama is yet to be revealed, but it is reportedly intended to compete with “Dream High 2” when it airs next year. The production is described as inspired by the American series “Glee,” featuring music in telling the story of the main characters’ hopes and dreams. This production will be Mnet’s first attempt at a music-themed drama of original content. “Sungkyunkwan Scandal,” a fusion-sageuk featured Park Min Young, Park Yoo Chun, Song Joong Ki and Yoo Ah In as students in a prestigious Chosun-era learning institution. [News] Gong Hyo Jin Reveals Friendship with Jung Il Woo. Gong Hyo Jin, as earlier reported, made a cameo appearance in an episode of “Flower Boys of the Ramen Shop.” The actress played a record shop assistant that helped Jung Il Woo’s character in locating a song. It is further revealed that Gong Hyo Jin’s appearance in the drama is because of her friendship with Jung Il Woo, the series’ main lead. A fun note: during this scene, her song "Thump Thump" from the drama "Best Love" was playing in the background. “Flower Boys of the Ramen Shop” is currently airing on tVN, Mondays and Tuesdays at 11:00 PM KST. [Photo & News] Jang Keun Suk Performs for 45,000 at the Tokyo Dome. Jang Keun Suk's known for toting himself as "Asia's Prince," but he became just that at his "2011 The CRI Show In Toky Dome" on November 26! Held at the legendary Tokyo Dome, the star managed to sell out over 45,000 seats for his Japanese fan meet concert. He held his first fan meet in 2008 and was barely able to fill 2,000 seats then, so this feat in just under three years comes as an astounding accomplishment. The Tokyo Dome is regarded as a concert hall that only the best of the best can perform in. Jang Keun Suk made his emergence in a blonde wig and spared no time in introducing himself as a prince. His stage was like a dream made into reality, a realization of everything he's worked to accomplish. "I'm holding my very own concert at the Tokyo Dome three years after holding my very first fan meet in Japan in 2008. I've always loved Japanese modern rock since I was little and it's been my dream since middle school to perform at the Tokyo Dome. It feels invigorating to have finally made it," the actor explained in his interview at the Ginza K Place. The name of his concert, CRI ("critical)" and "The Beginning" all stand for a new beginning as he reaches the 20 year milestone in his career. He invested $4.8 million USD and brought in two 20m cranes to be able to reach his fans watching from the third floor. "The point of my concert is to show my dream of becoming a prince and the castle I wish to live in, and the actualization of that dream. I planned a show that I could enjoy with all of my fans. I have a bit of a sadist personality, where I find joy in messing with others... (laughter). I don't think Japan has seen such a character yet. As long as it doesn't interfere with others, I just want to have fun and be honest. Being forced to do something I don't want to do doesn't sit well with me." Continuing, he added, "I only have songs that I personally sang in the line-up because as an artist, I think it's important to sing your own songs." On his personal life, he revealed, "The two days a week that I go to school I consider my rest period. It's hard to distribute my time, but I plan to just concentrate on my drama or concerts and rest where I can. I get IV drips about once a week to have my health keep up." As for the future, he has his 20th debut anniversary coming up, and he plans to hold a domestic dinner show tour. "I have Ryu Shi Won hyung to call or run to when I'm going through a hard time. There's this strong friendship between Hallyu seniors. As for me, I'm not enjoying my position as a Hallyu star, but rather just my life. I hate being content or safe, and my dream is to become Asia's prince, and later, a world prince. I'm just in the process of spreading out into the world." [News] Yoo Ji-tae and Kim Hyo-jin's invitation only has their names. Yoo Ji-tae (35) and Kim Hyo-jin (27) revealed their wedding invitations. A photographer posted on her Twitter on the 28th saying, "This is the most minimal invitation I have ever received" along with a picture. The invitation in the picture was light purple with the couple's names on it. Unlike other invitations, they don't have any fancy decorations or anything but simply just their names. The two met as advertisement models in 2003 and started dating in 2007. They announced their relationship in May that year and have been together since. They announced their marriage in August and are getting married on the 2nd of December at Shilla Hotel in Seoul. Those who have seen the picture say, "The invitations at last. So simple", "It's so them", "Yoo Ji-tae and Kim Hyo-jin I hope you guys are happy" and more. [News] Kim Hyun Joong Cast in New Drama? Kim Hyun Joong revealed that he has been cast in a new drama and will return to acting early next year. At the press conference for the 2011 MAMA, Kim Hyun Joong was flooded with questions from foreign media, reflecting his popularity in overseas markets. The last TV drama series Kim Hyun Jung appeared in is the SBS “Playful Kiss” that ended in September of last year. No information regarding his new drama has been revealed yet, as his agency hasn’t released anything either. We’ll keep you updated with more info so stay tuned! [News] Still Cuts from “Introduction to Architecture” with Han Ga In, Uhm Tae Woong, Suzy, Lee Jae Hoon. Still cuts from the movie, "Introduction to Architecture," featuring Uhm Tae Woong, Han Ga In, Lee Jae Hoon and miss A's Suzy have been revealed. "Introduction to Architecture" is about an architect named Seung Min (played by Uhm Tae Woong) who is visited by his first love during his college years, Seo Yeon (played by Han Ga In). The story starts with Seo Yeon asking Seung Min to design her old house for her. Uhm Tae Woong and Han Ga In act as lovers in the present time while Lee Jae Hoon and Suzy plays their younger, twenties love. In the revealed still cuts, you can see Seung Min's uneasy face expression due to his returned first love, Seo Yeon. On the other hand, Seo Yeon is deeply looking into Seung Min's face. In the other still picture, you can see the sweet but tense air surrounding the younger actors, as Suzy and Lee Jae Hoon portray the nervousness of a first love. Also, the strangely similar appearances and ambiances between Han Ga In and Suzy are especially increasing attention. Filming for "Introduction to Architecture" started last month on October 25 and it is said that about 40% of the movie is complete so far. Stay tuned on Soompi for more news about this film! [Spoiler] "A Thousand Days' Promise" Soo-ae and Kim Rae-won finally get married. Soo-ae and Kim Rae-won finally got married and became a couple. On the SBS drama "A Thousand Days' Promise" on the 28th, Seo-yeon (Soo-ae) with Alzheimer's accepted her love Ji-hyeong's (Kim Rae-won) proposal and got married. She tried pushing him away at first but she deiced to marry him. However, Ji-hyeong's parents weren't there. His father Chang-joo (Im Chae-moo) decided he didn't have a son anymore and was cold towards them. However, Ji-hyeong's mother Soo-jeong (Kim Hae-sook) accepted her son's request and sincerely wished for them to be happy as long as he chose this path. She knew that it was going to be hard for her son to marry a woman with Alzheimer's but she supported their happiness. Both Seo-yeon and Ji-hyeong's parents weren't present at the wedding but they were blessed by their friends and people around them. They vowed to each other and reassured their love for each other. Seo-yeon wearing the beautiful off shoulder dress and Ji-hyeong looking at her with loving eyes and kissing her was the highlight of the scene. However, there seemed to be hardship after all the happiness. The preview of the next episode showed Seo-yeon and Ji-hyeong fighting seriously and she was yelling at him that he was a nightmare. The two got married after many ups and downs but it seems as though Alzheimer's was going to give them more tests. A fancy teaser poster for a new film Papa (directed by Han Ji Seung and produced by Sang Sang Film) is released. The teaser poster is attracting attention with fancy colors that indicate the film’s various charms. In the poster, Park Yong Woo is smiling brightly in a deep red truck and Go Ah Ra is singing into a bottle of coke as a mike. It seems like they are going on a family trip. Including other five kids, they all look very happy and excited. Also, the copyrighted phrase “The Wonderful Birth of a Colorful Family” increases people’s curiosity about the family. It seems like there are hidden stories behind them. Filmed entirely on location in Atlanta and directed by Han Ji Seung, this film seems very interesting to watch. Papa is a family movie about six kids and a manager Chun Sup (Park Yong Woo). The six kids are about to be scattered and Chun Sup becomes an illegal immigrant in Atlanta because of his top star who ran away. It tells a hilarious story of how they became a phony family. It will be released in January next year. [News] Kwon Sang Woo is in good condition "He continues shooting in China until January next year"
According to Kwon’s agency on the 28th of November, Kwon left for China on November 20 to shoot 12 Chinese Zodiac Heads. He visited Japan to promote the film Pain on November 18, then arrived at Beijing on November 20 in order to begin shooting in earnest. Kwon was originally scheduled to finish shooting 12 Chinese Zodiac Heads this year, but it has been postponed due to the treatment in Korea for his injured right ankle. Last year, Kwon injured his ankle while shooting 71: Into The Fire and injured the same place shooting Pain. Nevertheless, he continued shooting 12 Chinese Zodizac Heads since July with Jackie Chan, and the injury has gotten worse. In case of surgery, he has to go through rehabilitation until the beginning of next year, so he has underwent three stem cell procedures instead. After shooting 12 Chinese Zodiac Heads, Kwon is heading to U.S. if the contract of shooting an American action film is completed. Within a month, Kwon is to complete the contract. [News] T-ara's Jiyeon to Play Major Role in "Dream High 2". “Dream High 2” will be more music-oriented than its first season and will have a higher focus on singing and dancing. Jiyeon and her fellow T-ara members are currently busy with the promotions of their new hit single “Cry Cry” and the preparations for their upcoming single “Lovey Dovey.” They are also busy with their Japanese promotions. [News] "Please stop hurting the people I love," says Ariel Lin. Taiwan singer-actress Ariel Lin confirmed in a micro blog post on Thursday, that she had broken up with her boyfriend Cheng Jia Yao because her showbiz career got in the way of their love. She also spoke out against recent media reports that claim she broke up with Cheng after he lied to her about his age. "Please stop hurting the people I love, have you all not fallen deep in love like this before? "Please don't use unverified hearsay to repeatedly fiddle with the open wounds of innocent people," said Lin in her micro blog post. "Yes we have broken up, but it isn't because of age, or a matter of trust. It is just that the environment is too complicated and the nature of my work is too challenging ... "
Lin went on to express that she hoped Cheng will find a suitable girlfriend soon, in another post with an almost lyrical quality to it. "We (Lin and Cheng) worked hard on it, tried it, but in the end could only wish each other well and say goodbye," said the 29-year-old actress. "It hurts, it hurts, but we still must break up. So I hope the media can let them off and give his family the space they need." "I only hope someone as good as him will find a truly suitable girl and have the complete happiness that I could not give him." 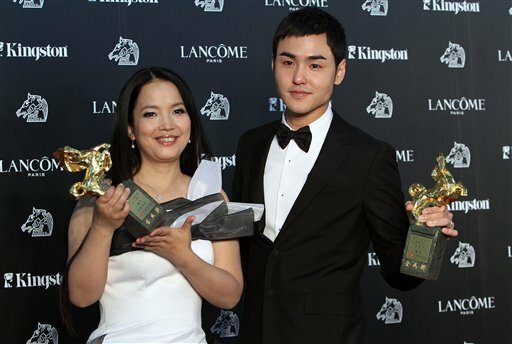 [News] Winners of the 48th annual Golden Horse Award. The 48th annual Golden Horse Award has just come to an end. 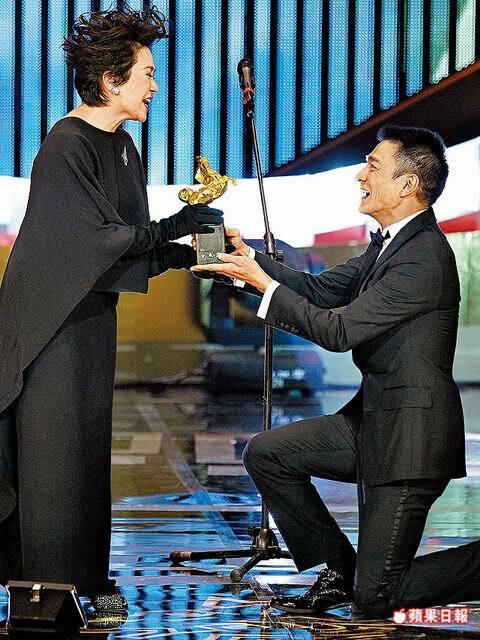 The biggest story of the night is without a doubt Andy Lau and Deanie Iptaking home the Best Actor and Best Actress awards for their roles in "A Simple Life". [News] "Dream High 2", Hyorin, Kang So-ra and Jinwoon? "Who will be the hero of "Dream High Season 2""? The outline of KBS 2TV drama "Dream High Season 2" is slowly showing itself. The issue for the drama is, who will be the hero/heroine of "Dream High Season 2". With the first episode coming up on the 30th of January, actress Kang So-ra, 2AM's Jinwoon, and Sistar's Hyorin are being discussed. Other casts haven't been notified of. "Dream High Season 2"will finish off the casting until next wekk and start shooting on the second week of December. Only Park Jin-youngwill be making reappearance in the second season of this drama. He will be the teacher he was in the first season and become the connection from season 1 to 2. It seems like it will be hard to see 2PM Taecyeon, Wooyoung, Miss A Suzy, T-ara'a Ham Eun Jeong and other's from the first season this time. The singers of JYP Entertainment from the first season will not be able to go along with the second season mainly sue to their schedules. 2PMhave a tight line-up of overseas tours until early next year and Miss A and the Wondergirls are concentrating on their music. The actors of Key East under Bae Yong-joon, are also under the covers for the second season. SM Entertainment which was part of the plan at first with TVXQ, Super Junior and Girls' Generation, has decided not to be involved. [News] ‘Full House 2′ stars head for Japan. The three leads of the upcoming drama, ‘Full House 2‘, No Min Woo, Hwang Jung Eum, and Park Ki Woong left for Japan on November 27th through Incheon Airport. The three will be filming in Japan as the show will first air on Japan’s TBS channel, in March of 2012. The drama is receiving much popularity in Japan. The show is also gaining much interest abroad as it will add to its cast Japanese and Chinese stars, making it a real ‘Hallyu’ drama. ‘Full House 2′ will follow the original plot of Woo Soo Hyun‘s comic book that tells the tale of a mediocre writer engaging in a contract marriage with a petulant top star. [News] Han Ga-in chosen for main role in MBS "The Sun and The Moon". Han Ga-in is attempting at her first historical of her life. She has been cast as Yeon-woo, the main act in the upcoming MBC drama "The Sun and the Moon". "The Sun and the Moon" is a fantasy romance historical about a King Lee Hwon (Kim Soo-hyeon-I) and a woman, Yeon-woo who was crowned Princess but gets involved in unexpected events and has to live as an exorcist. While looking for Yeon-woo's lost memories, the love between three men around her will be shown dramatically. Han Ga-in has been known for her goddess-like beauty ever since her debut and many of the original picture fans have supported her as the right actress for this mysterious role. This is her first drama since "Bad Man" a year and six months ago. She chose the solidity of writer Jeong Eun-gwol, the collaboration of producer Kim Do-hoon from "Royal Family" and writer Jin Soo-wan and the complicated features of Yeon-woo's character as the reason why she chose to do this drama. Her management said, "The main character of this drama is different from those we have seen so far with her complex attraction and unfortunate fate. Han Ga-in considered this project as her come back piece and was satisfied with the fact that she could extend her acting talents". The management continued, "She chose "The Sun and the Moon" after careful consideration and Han Ga-inis excited about it. She is preparing for the drama with the idea that she will expand her acting spectrum and take a new leap". Meanwhile, Han Ga-inis currently shooting the movie "Architectural Theory", a piece she's doing for the first time in 7 years. [News] T-ara Jiyeon cast for "Dream High 2". T-ara Jiyeon has been cast for "Dream High Season 2". Drama "Dream High" is popular for its idol cast of 2PM Taecyeon, T-ara Ham Eun-jeong, Miss A Suzy, IU and others. The second season is coming on the 30th of January next year. Jiyeon met with the director and finalized all details about her role last weekend. "Dream High Season 2" is about to be more focused in music and dancing than the previous season. Jiyeon is currently busy with activities for "Cry Cry" and is preparing "Lovey Dovey" another album for January next year. Jiyeon said, "I am busy with activities nationally and internationally but I wanted to try out this role in "Dream High Season 2". I am going to think about the time I was in training before my debut and work hard to make this character work". [News] IU Releases Official "You and I" Teaser Music Video. On November 27, the official music video teaser for IU's second studio album comeback, "Last Fantasy," was revealed! The teaser was of her title track, "You and I," which featured a dramatic, fantasy-like setting reminiscent of Sunny Hill's "Midnight Circus" with the incorporation of blank faced dancers. Her tracklist itself has been garnering quite the attention. As expected, her title track is the work of composer Lee Min Soo and lyricist Kim Eana. They've worked with IU in the past and are known for creating chart topping hits like "Good Day." As such, "You and I" is expected to continue in the footsteps of success of "Good Day." Her album, "Last Fantasy," is about the feelings of love a girl has while standing on the threshold between her teens and her 20's. The album also contains the works of names like Yoon Sang, Kim Hyung Suk, Jung Jae Hyung, Lee Juk, Yoon Jong Shin, and others. Loen Entertainment officials commented, "With a fantastical setting and an emotional feel, fans will be able to see a more mature IU. Please look forward to her comeback." On November 25th, KAT-TUN attended the press conference for their new CM with Suzuki, where they announced that they’ll be holding a nationwide tour starting on Feburary 11th, 2012. It will be their first nationwide tour in 2 years, and so they’ll be visiting 12 cities, including Niigata, Nagoya, and Tokyo. The pop group revealed that they’re planning to hold the tour’s final stage in disaster-stricken Sendai, thus becoming the first Johnny & Associates group to hold a concert there after the Tohoku earthquake. It’s a long-awaited live for both the group and their fans, since the earthquake forced the cancellation of KAT-TUN’s first 5 Dome tour and big open-air live event in the area. The group also announced that they’ll be inviting fans backstage, should they purchase their new single ,”BIRTH“, and win the random lottery. KAT-TUN will be endorsing Suzuki SOLIO’s specially-designed car, whose design was inspired by KAT-TUN’s new song, “STAR RIDER“. “STAR RIDER” will be included in both their upcoming single and CM. [News]2011 Blue Dragon Film Awards. Awards, awards, awards! Friday, November 25, was the night of the 2011 Blue Dragon Film Awards, and — no surprise — the winners list was dominated by one of the biggest films of the year, sageuk-action-thriller Bow: The Ultimate Weapon. The film is a David and Goliath story of one man (Park Hae-il) taking down the enemy with his exceptional prowess with the bow and won awards for most of its leading stars. A few other films also nabbed multiple awards, with best picture going to the thriller Bad Deal. (which also won for director and screenplay).